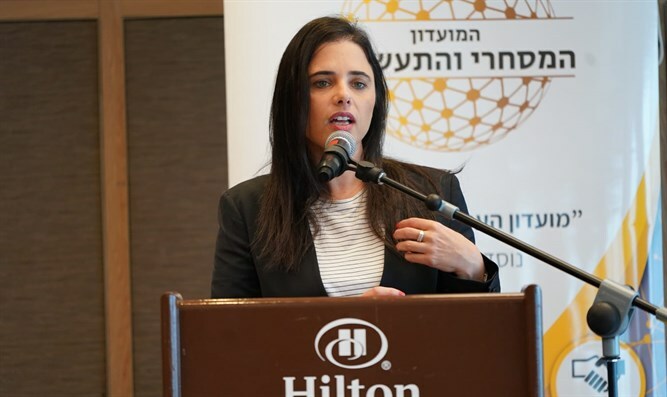 Justice Minister Ayelet Shaked on Friday discussed developments in the coalition and reiterated the Jewish Home's demand that Naftali Bennett be appointed defense minister. At a meeting with the commercial and industrial club in Tel Aviv, Shaked said that "We have a week to decide whether to go to elections or the government will fill its days until November 2019". "In view of the crisis of security trust, it is essential to appoint Naftali Bennett as defense minister in order to restore deterrence to Israel. Israel can go back to winning. It is not right to leave the situation in the south as it is." Shaked emphasized that "if we decide that we are going to elections, we must do so within three months, no more than that, in order to prevent harm to the economy, security and to reduce the amount of toxic public discourse". On Thursday, Bennett said at an Education Ministry conference that he demanded to succeed Avigdor Liberman as the defense minister in order to restore Israel's deterrence vis a vis Hamas. "Without taking responsibility for security and without dramatic change, Israel's deterrence will continue to erode, Hamas will continue not to be afraid of us. As defense minister, I intend to bring innovation, creativity and a spirit of fighting, to break a decades-long mental state," contended Bennett. "I am willing to take responsibility."